We did go for a run yesterday and of course we had an adventure, well, more of a near adventure. First I have a short story that leads up to the near adventure during yesterday’s run. I quite often run/walk Kobi just using an e-collar, kind of like an invisible leash, as we live in a very rural area and rarely run into other walkers or dogs (just bears). During yesterday’s lunch time walk she had on her e-collar, she sees a few ravens and takes off at about 30 km/hr after them. She hasn’t quite realized she can’t fly or she’s just so angry she can’t fly she feels compelled to chase ravens or maybe the ravens are calling her names as ravens are quite smart and are perhaps insulting her in canine. I call her back and she doesn’t listen so I start the e-collar warning process: 1) I call her to return, if she doesn’t return, 2) I give her the warning buzz, if she still doesn’t listen and there is no imminent danger, two more warning buzzes are given while calling her back, if still no response, 3) give her the little zap to get her listening. Well, I was yelling, buzzing and buzzing and yelling some more and no response. I’ve gone to zap mode now and still nothing. I’m thinking, hmm, she must be getting really tough or is really focused on these ravens. Nope, the battery was dead. So that leads me to our run later that same day. I now know that the e-collar has a battery issue, but I do not have the technological savvy to change the battery (that would involve a screw driver – you can roll your eyes) and I still decide that she will wear the collar (and maybe she won’t realize that it doesn’t work). 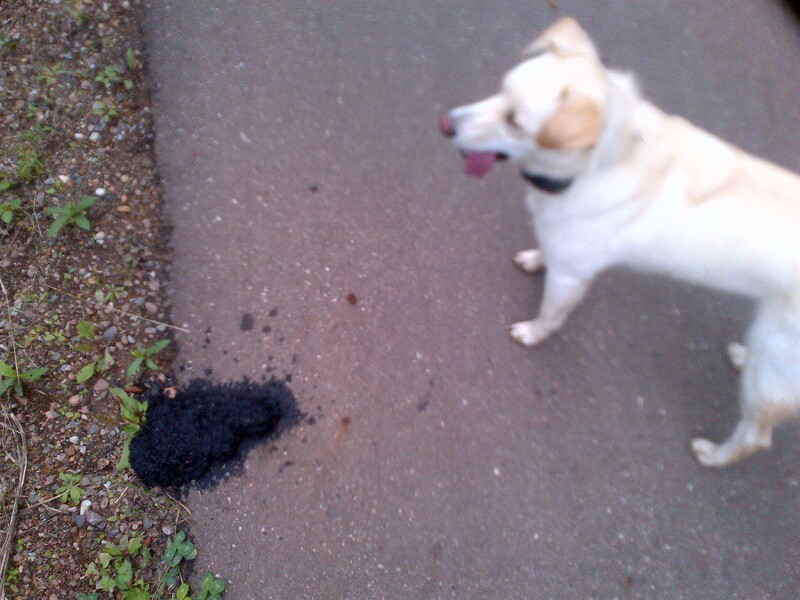 Off we go out onto the community trail and after about 5km’s into the run, I see a big steamy pile of bear poop. I spend about 3-4 minutes trying to take a picture of Kobi with the poop and all the while she’s more interested in the two squirrels having a territory battle in the woods beside us. I have to thank these squirrels in some way as once I finally stop my fascination with the bear poop I start running again and look up to see a big shiny black bear chowing down on rose hips about 50 m up from me. Kobi is still distracted by the squirrels and didn’t see or smell the bear – thankfully. As you may recall, the e-collar does not work and she is off leash (okay, not smart and yes you can roll your eyes again). I playfully call her name and turn around to avoid a potential bear encounter. 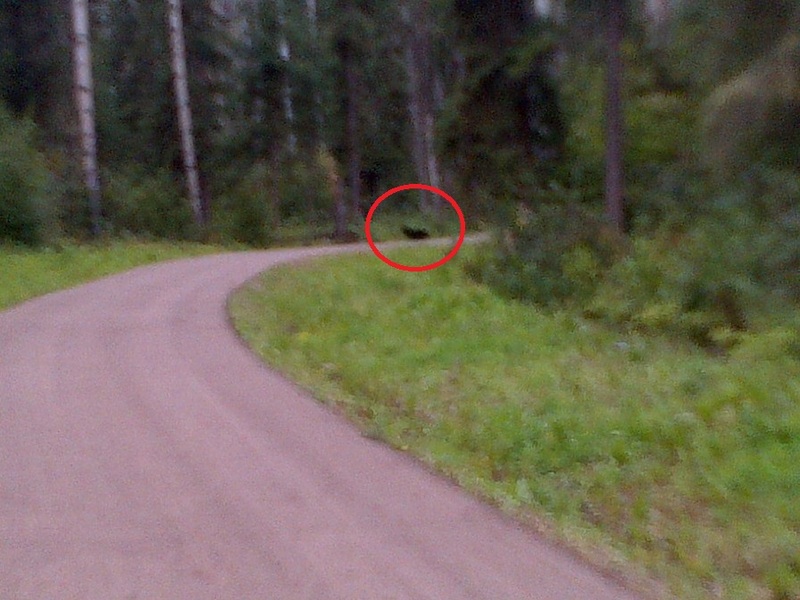 Of course I was shoulder checking for about 2km, but the bear showed no interest in us. I can hardly wait for Saturday’s long run, but at least the e-collar battery has been replaced. 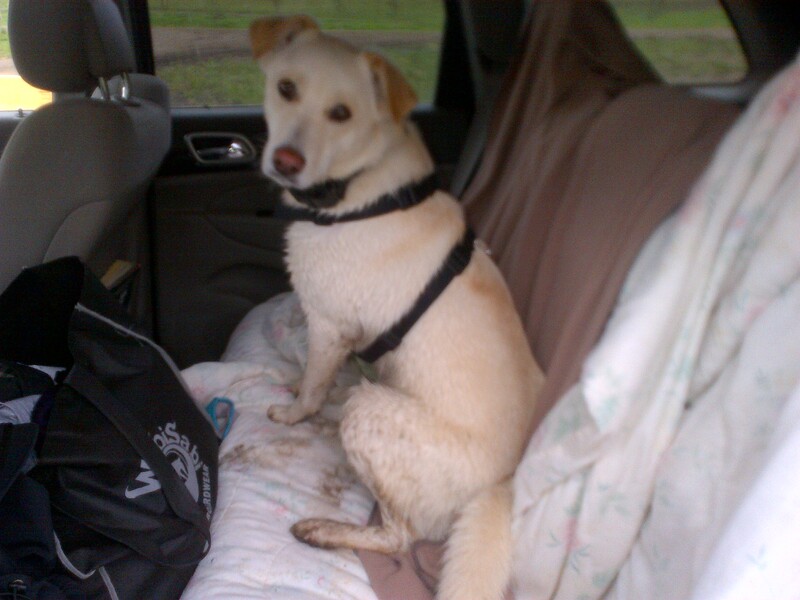 Categories: Training | Tags: bear, dog, outdoors, Running, squirrel | Permalink. It’s August and it’s already cold outside. Not unusual when you live north of the 58th parallel. I went so far as not completing my long run (20km) on Sunday because it was raining and windy and cold and yes, I’m made of sugar. I should’ve just sucked it up and done it because Kobi (my dog) was annoyingly hyper all day as a result and I ended up restless and feeling guilty for not doing it. I hate that feeling of guilt. Weather should never really be an excuse not to run. Okay, it can be an excuse, but rain and a bit of wind is not really an excuse. Tsunamis, tornadoes, blizzards and excessively cold or hot temperatures are excuses. Even then, if the power hasn’t gone out, there is always a treadmill one can find. I’ve also done this long enough to know that the guilt will get to me and now I can’t make up that long run because it’s already Thursday and I’ve lost my long run weekend window. I do have another excuse for not running and it’s likely the root cause of my first weak excuse: bears. They are out in droves this time of year. I swear the colder temperatures has them scrambling to fatten up for winter on whatever rose hips, cranberries, crab apples and guilt-ridden runners they can find (I don’t think they like eating guilt-ridden runners though, too sour). Most of my bear experiences have involved me screaming and the bear screaming and both of us taking off in opposite directions, but there have been a few times when the bear didn’t leave and I was probably a bit too persistent in wanting to pass where he or she was versus just turning around and getting the heck away. Having Kobi now adds a new element to bear experiences. She freaks when she sees them or smells them. Her hackles go up and she barks like a crazy dog – looks kind of dragon-like actually. That has to date scared the bears away, but I’m concerned that on some random occasion she is going to bark at the wrong bear and come charging back to me for help with a bear charging behind her. That scares me. Hmm, what’s worse, fear or guilt? I think guilt. I clearly need to go for a run. Besides, it might make for a good story and I’ll likely run a bit faster out of fear. 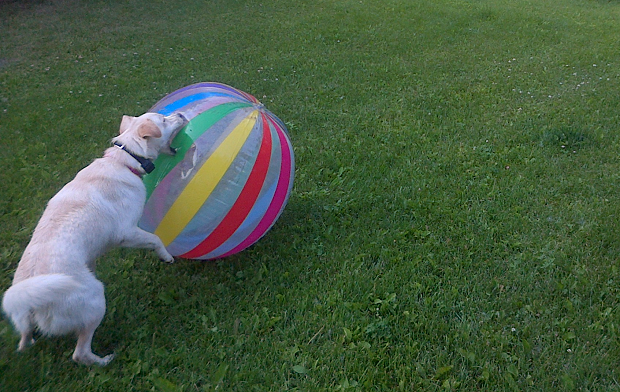 Categories: Training | Tags: bears, dogs, Running, training outdoors | Permalink.